Blazing SEO Review 2018 - Why are the Blazing Proxies so much cheaper? Blazing Proxies was founded by Blazing SEO in 2015. Blazing SEO not only offers proxies but also OCR/text captcha solving services and an archive org scraper. That’s a new proxy service starting their business on BHW. All their proxies are hosted on dedicated servers that are running only at 20-30% CPU and RAM, and they’re on 1 Gbps dedicated network line each. Blazing SEO LLC also set up a custom API that you can use to automatically buy/replace/cancel proxies and you can setup it on GSA SER to automatically grab your proxies at a certain interval. An astounding 80% of their users mainly use their services for GSA Proxies. And there are no software restrictions. Yet another great feature — Blazing Proxies will allow unlimited/unmetered bandwidth to all of your purchases, and promises that their IPs WILL NOT be oversold to other customers. So if you’re tools or work requires a lot of bandwidth, then you should definitely give this service a shot. 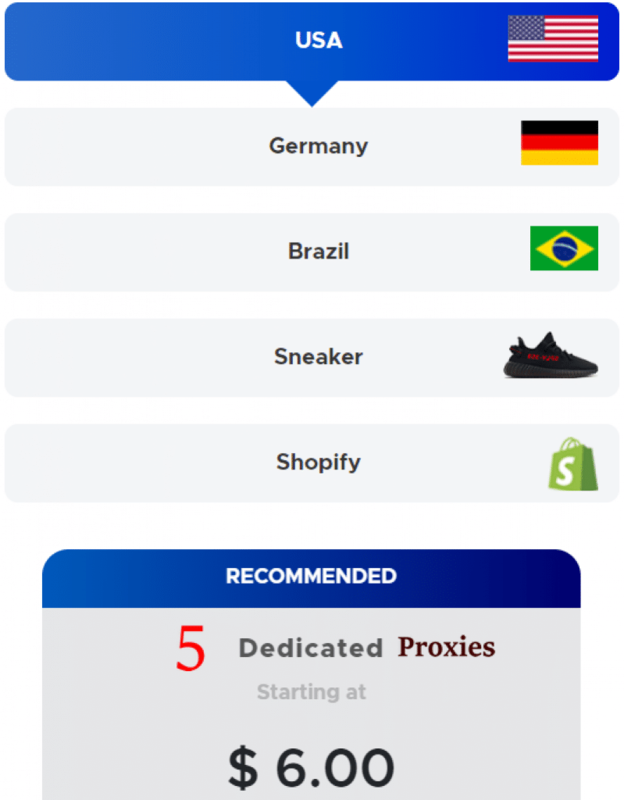 Blazing Proxies now offers 3 different type of proxies across 4 countries – USA, Germany, Brazil, and South Africa. This is a really interesting set of geographic locations. Typically a proxy provider will only offer locations in the US and UK, and occasionally Canada. The fact that they provide locations in South America makes them a bit of a novelty in the world of proxies; so if your needs require server locations from Latin America or South Africa, this is one of the only providers with those as an available option. Their servers also support HTTP(s) and SOCKS protocols. Below are the price plans for their USA proxies. The price of the Germany, Brazil, and South Africa proxies are more expensive than the USA IPs. This is because, as stated before, it is a bit of a rarity to find a proxy provider with those kinds of international options. These proxies are FAST and only used by you. No other user will have access to them. This means that you won’t have to share your speed with anyone, and the only person who can get your IPs banned is you. So the lifespan and mileage you’ll get will be amazing. They are a bit more expensive than the Semi-Dedicated proxies below, but that’s because you’ll be getting the fastest speeds possible. These proxies are ideal for software like GSA SER that simply run faster when you have access to faster proxies. Our speeds indicate an average latency of 0.1 – 0.9 seconds… If you choose Semi-Dedicated proxies your speeds are likely to be x3 as slow, which means x3 slower link building. If you’re wanting to use the proxies for socia marketing, you have to choose these more exclusive proxies. That way there’s no need to worry about the accounts being banned by another user. These proxies are also fast, but not as fast as the Dedicated Proxies. They will be shared between a MAX of 3 users. Not only do you sacrifice speed, but this means 2 other users are burning the proxies on potentially the same sites you are using them for, resulting in banned IPs and limited use on certain sites. HOWEVER, these prices are substantially cheaper, so if you’re on a budget these are the ones you want. They’re also great for more casual users simply trying to keep their internet data and usage anonymous. Both dedicated and semi-dedicated have truly unlimited threads and bandwidth, so there’s that as well. Sneaker proxies are a little hard to come by, since the websites that you’re trying to access are severe when it comes to banning addresses. The proxies are also dedicated proxies and special for footsites. But you should note that the Sneaker Proxies are ZERO REFUND POLICY! Blazing SEO does NOT guarantee proxies to work for any sneaker site…That’s means the proxies may be banned already. I think the lack of confidence they show in their sneaker proxies says a lot about the quality of these proxies. I understand that sneaker proxies are rather difficult to manage and maintain, but it seems as if Blazing Proxies doesn’t mind leaving it up to the consumer to gamble with the purchase of the proxies. And the fact that there is no refund policy seems absurd. So while the rest of their services seem to be pretty great, I don’t recommend that you try their sneaker proxies, unless you really need this kind of service. 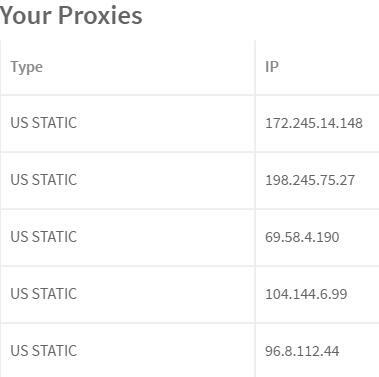 These proxies are used only by you at any given time, but every 10 minutes your proxy will rotate to a NEW private proxy. What this means is that you have access to a large pool of IP address, However everyone else who buys Rotating proxies also has access to this same pool (meaning the proxies may be burned for your uses). So the speeds may be a little slower, but they offer the best security and privacy out of all of the other services, because your IP address is never the same for very long. Their some thing you should know, Blazing ROTATING proxies do not work for scraping specifically on Google! And Do limit you to 10 threads per proxy. At the bottom of the home page is a link that takes you to their customer support portion of the site. It’s a little less robust looking, but it gets the job done. The Blazing SEO support team is available 24/7, all year round. So no matter when it is, or what issue you encounter, you shouldn’t have any issues getting the help you need. It’s a ticket based system that allows you to attach files when submitting, which is pretty handy. They also have a lot of questions already answered in their Frequently Asked Questions section of their customer support page. They also have a forum for users to discuss about their proxies. I think this is a really great feature, and would be really helpful for users to interact, review, and help each solve common issues. However, it doesn’t seem like anyone has posted anything there yet, so even though it’s an awesome feature, it isn’t really being utilized. I’ve purchased 5 private proxies for testing, Their control panel is easy to use & setup. I choose the ‘Mixed’ cities option, so i get non sequential IPs after 10 minutes so it’s auto deliver. The proxies are fast with good uptime. And it’s works well on GSA, i also test it on instagram, 2 proxies works on it and 3 proxy show “The proxy server is refusing connections”, compare with the price that’s acceptable， but if you’re serious on use the proxies for social media marketing I suggest you use other special proxies for IG. You may be like to find Our Recommend Instagram proxy services. Blazing SEO offer cheaper proxies with fast speed and takes the proxy business seriously, always provide a quick support, For their price is very competitive, it’s a cost-effective proxy provider as instant proxies. They’re a pretty good, mid-range proxy provider. For the average user of proxies, this is a great service. Though if you are looking for sneaker proxies, we recommend looking at one of the other services we have reviewed. Thanks for reading our review! If you have used this service before, please share your review in the comments below! Neil’s proxy plans are the cheapest ones which easy to begin. I’m using this service for 2 months and I will keep using it for i am not so care about the speed:) Love you man! Keep doing the great job you started! Purchased dedicated proxys, order went through fine. Logged in to the site, chose my cities for the proxies. 3 hours later all my ip addresses were still listed as pending. Sent an email to support. 3 days later they replied and said that everything was fine with it. IP Addresses were still “pending.” Asked for a refund, and they said that I had used them and they cant issue a refund, then they closed my support ticket. Not sure how I was supposed to have used them when I was never given their ip addresses. At this point they’ve simply stolen money from me. I will not rate a service. Just want to note I’m disappointed because I received my username and password in a plain text after registration. Also only option for paying is PayPal. Bought 200 proxies, 10 worked. Messaged support complaining about 1 day old proxies being banned. Support replaces my 200 proxies… only 1 works. Whatever can go wrong… will. Although I initially requested a server and proxies in LA, there were none available so I was given a server in NY. After servers became available in LA, they switched me over, but I then needed to switch my proxies to LA as well. I followed the instructions to realize that I had to use ALL of my monthly proxy replacements to make the location transfer. After discovering that over 75% of the proxies did not work for any footsites or target shops, I had no way to request replacements. My 200 proxy plan was essentially cut to 35. Same happen to me. they had an error couple hours before the release. Great proxies at a great price! They’re great for any use really. Everything updates very fast and they have great support. I have been looking for a private proxies provider for the past 2 months. I tested a few providers, some were bad, others were fine. A few weeks ago, I decided to test Blazing Seo, and bought 5 private proxies. I never had any dead proxy during this time, and the few times I used the support to ask questions, I got really quick answers. It’s cheap, it’s reliable and the proxies work great. Have tried another provider before using Blazing costing me 4 times as much to get to the same result. I am currently using 10 semi-dedicated and 10 sneaker proxies. blazingseollc are one of the best proxy providers out there!! the reliability and speed is amazing, so i’m sure i’ll keep using the services if not order more in the future. I’ve been changing proxy provider for 3-4 times before I found Blazing Proxies. Compare to others there Blazing Proxies is the best. Fastest activation time. High Speed Connection. Cheapest price. Super responsive support. Totally recommended. am currently using 10 semi-dedicated proxies and 5 rotating proxies plan as well. Great service, I recommend it! The Pros is the price and easy to use proxies management system. However you get what you pay for..
1.speed,The ping usual are more than 300ms, I really not satisfy it! 2.Support is by the owner,so i have to wait 10 hours for i live in another hemisphere. 3.And the other is their website reported as an attack site on my chrome!!! I really worry about my account security! Found Neil’s service on BHW forum after searching for a new proxy provider. I have used my previous provider for over a year, but their speed was not up to my standards and needs, but I could not find a good provider until now. Checked prices and reviews on the forum, then I thought let’s give it a try. First of all, this service is freakin’ AMAZING! Previously my upload speed with my old proxies were between 150-200kbyte, now I am uploading with an average speed of 800-900kbyte!! Which means I can be 4x more productive like before, for me that is SUPERB! The price is also unbeatable, I am paying $6.50 for 5 proxies, that means $1.30 per proxy which is nothing for this quality service. I am extremely happy with his support too, got all my questions replied quickly. In my opinion that is a MUST nowadays. Other companies should take Neil’s service as an example. I am staying with his proxy service for a very-very long time and already recommended to my friend, who also purchased his proxies from him and he is very happy too with the quality. Did I forget to mention that the proxies I have bought were activated after 10 minutes? No more 12-24 hrs or longer waiting times like you do with other companies. 2 thumbs UP for this guy!! 5* all round for this service. Why? They’re cheaper than most, more reliable and have a very good, responsive support. I’ve tried a number of other providers and some are very good but I’ve yet to find one better. I think they also offer a free trial so it’s no risk to take them for a spin.